2013-14 SP Authentic #304 Dougie Hamilton RC AU FWA /999 Bruins Hurricanes WOW! 2013-14 The Cup Dougie Hamilton GOLD Auto Rookie RC Patch RPA 13/27 Hurricanes. Condition is Like New. Shipped with USPS First Class Package. 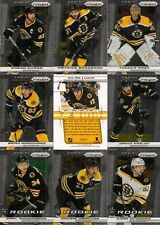 You are purchasing a complete team set of Boston Bruins from the 2013-14 Panini Prizm Hockey series. The complete team set includes the short-printed Rookie cards numbered 201-300 when applicable. The 10 cards in this team set include. Hamilton Blue Dual RC Class Panini Prizm 2013-14 Hockey Card #207 🔥🔥 Rookie !! 2013-14 National Treasures Dougie Hamilton Rookie RC RPA Auto & Patch /99. Condition is Like New. Shipped with USPS First Class Package. & PROCESSING. & HANDLING. Nous avons. We have more than 600 000 cards in or stor e inventory! I'm a paragraph. It's easy. Describe your product. I'm a title. Dougie Hamilton. Autograph Jersey Card #293. " Rookies Jersey ". 2013-14 Panini Select NHL Hockey. First Card. •Orders may be. Canadian Residents must Add GST or HST on final cost . Country Service Available. 2013-14 NATIONAL TREASURES ROOKIE PATCH AUTOGRAPH #149 DOUGIE HAMILTON 19/99 !! All cards are in Mint/Near Mint condition, and any visible flaws are from the toploader or the scan unless otherwise noted. 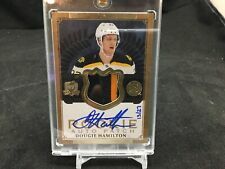 2013-14 Panini Dominion Rookie Patch Autograph card #196 of Boston Bruins Dougie Hamilton. Card has a nice 2 color patch and is short printed to 199 cards, with this being card 146/199.